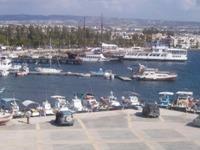 Paphos, Cyprus Information, History, Geography and Facts about Living and Buying Property. Paphos district consists of four municipalities: Paphos, Yeroskipou, Peyia and Polis Chrysochous. The area has many popular Paphos villages with a population of 66,364 in 2001 and the land area is 1,393 km.² North-west of the Paphos District is the Akamas peninsula. The landscape in the Paphos area varies from the the coastal plain, the hilly area extending from the coastal plain up to the igneous rocks of Paphos forest and finally the mountainous region. When Turkey invaded and occupied the major tourist resorts of Keryneia and Ammochostos the government invested heavily in the Paphos district. The private sector also began showing interest and developing Paphos. There was rapid economic activity in all fields and especially tourism. The district's population started increasing and Paphos started moving from being the most underdeveloped part of the island to one of the most popular and desirable areas. The government invested heavily in irrigation dams, water distribution works, road infrastructure and the building of Paphos International Airport while private initiative concentrated in hotel, apartment and villa construction and the entertainment infrastructure. Today, it is obvious Paphos is a thriving city with a strong economy. The charming west coast town Paphos with a population of 38,000 is divided into two sections, Kato Paphos and Paleo Paphos (Old Paphos). Kato Paphos is the lower part of the town and has a life of its own down by the sea - home of the harbor, fish taverns, souvenir shops and beautiful hotels with important archaeological sites around them. The whole of Paphos was actually designated a World Heritage Site in 1980. Paleo Paphos is the old town at the top of the hill that has the old, covered market where you can buy everything form souvenirs to fresh fruit, vegetables and fresh fish. In addition to this charming old market there are numerous high street boutiques, sandwich and coffee shops and a variety of other tradesmen dotted throughout the town. All amenities are located in both Kato Paphos and Paleo Paphos such as pharmacies, private medical clinics, opticians, private English schools, public Greek schools and grocery stores. 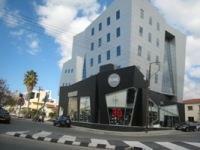 The large, modern general hospital is located in Paleo Paphos, close to Anavagos Village. No matter where you live whether it is in Kato Paphos, Paphos town or any close by surrounding villages you will have all amenities and services near by. Living in Paphos allows for a simpler way of life. The area is full of natural beauty and wide open, undisturbed spaces where you can unwind and relax. You get the best of both worlds living in Paphos as you also get a modern infrastructure, great shopping, up-to-date hospitals and lots of restaurants and bars to enjoy. In addition, the recent upgrades and privatization of the international airport just outside of Paphos (5 minutes from Yeroskipou, Mandria and Anarita villages) will continue to increase the desirability of the Paphos district. Cyprus's adoption of the Euro on January 1, 2008 makes it easier for tourists visiting the island and for locals to travel in Europe as they can better be able to compare prices in 15 countries using the same currency. It will also boost foreign direct investment and the elimination of exchange costs. Paphos and the surrounding area has seen strong growth in the housing industry over the last decade, especially with British expats. Now, many villas in Paphos and other properties came back onto the market due to the global downturn with many homeowners needing to sell their second homes to access their cash. There are many desirable seafront villas, bungalows, flats and undeveloped and desirable plots of land that would make the perfect spot to purchase your own dream home. Buying property in Paphos or Cyprus is like anywhere else, a lawyer is needed to research the property in question and ensure that all aspects of the purchase are in order. There has never been a better time to purchase property than now due to the economic state of the property sector not just in Cyprus, but worldwide. If you have the money , now is the time to invest as prices have fallen and interest rates are low making it a fantastic market for buyers.